Last week was Rob’s birthday – of course there was no way it could go by without a cake! The choice was easy – he’d even asked weeks before – probably his biggest hobby (golf being a close second), is the band he plays bass guitar in. I’d had a good scout round online for guitar-shaped tins, Wilton make a great one, but the cheapest I could get it for in the UK was about £15-£20 including postage, and I couldn’t justify it to use for just one cake. Scouting around I found quite a few guides on how to make one using ordinary cake pans, and decided the way forward was a bar made in a loaf tin, with the main body of the guitar from a round. As there was going to be so much decoration on top, I decided to just do one thick layer of cake (rather than two thin ones filled with buttercream), so it wouldn’t slide around all over the place. 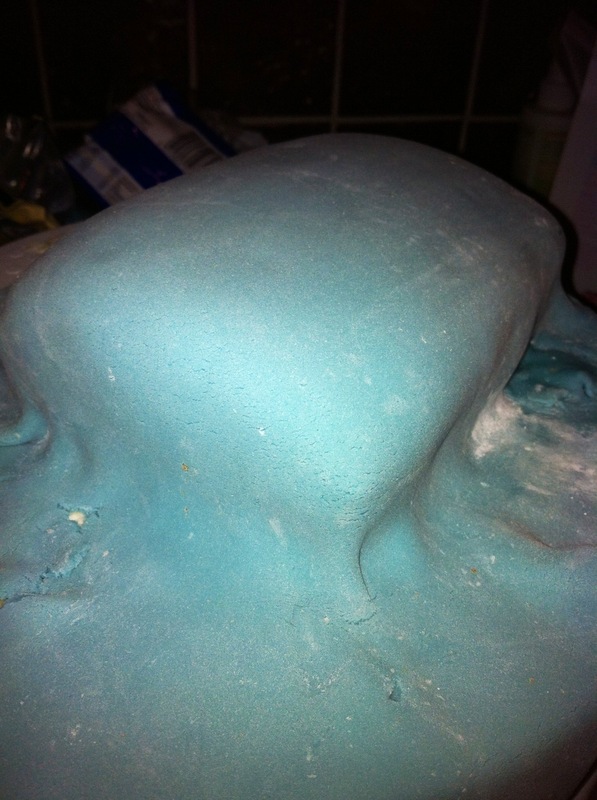 So that the different icings didn’t get mixed together, I left the neck on the board, and took the body onto my cake turntable to cover in buttercream and fondant. I was umming and aahing for a quite a while over what colour the guitar would be, when suddenly my eyes fell on his favourite colour – a brilliant bright orange! 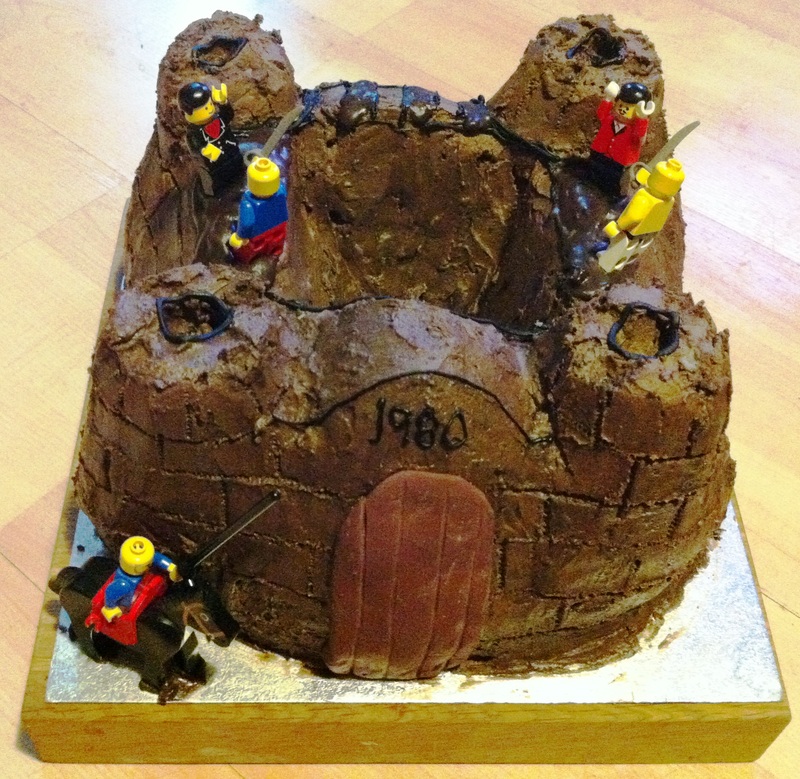 Because the curve of the body was quite gentle, it was no more difficult than a normal round to cover in the orange fondant, and I used a pair of scissors to cut a smaller, matching shape out of white – keeping it rolled quite thick made it much easier to handle while still keeping its shape. The neck was covered in a dark grey buttercream; I added a bit of royal icing sugar in with the standard kind, to give it the extra glossy finish, and smoothed out as best I could! The cakes pushed together easily where I’d shaped them before, and I painted a little more of the dark grey buttercream onto the body to finish off the neck. Then it was onto the details – the strings were red liquorice laces, which I’d painted before hand with some black food colouring. Next time I’ll spend a little longer shopping and get some black ones, but they still looked pretty good for what I could get from my local supermarket! Oh technology, you continue to amaze me! 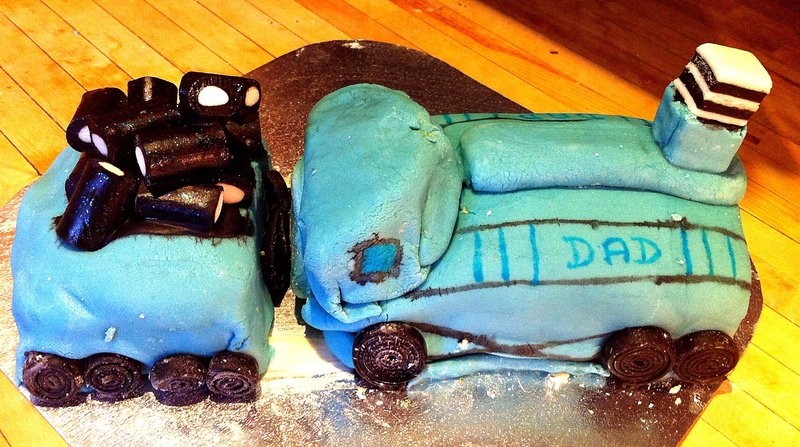 Last week was my dads birthday, and the obvious choice was a train cake. He’s loved trains for as long as I can remember, I went on many a train ride as a child, and my parents house is full of model trains! 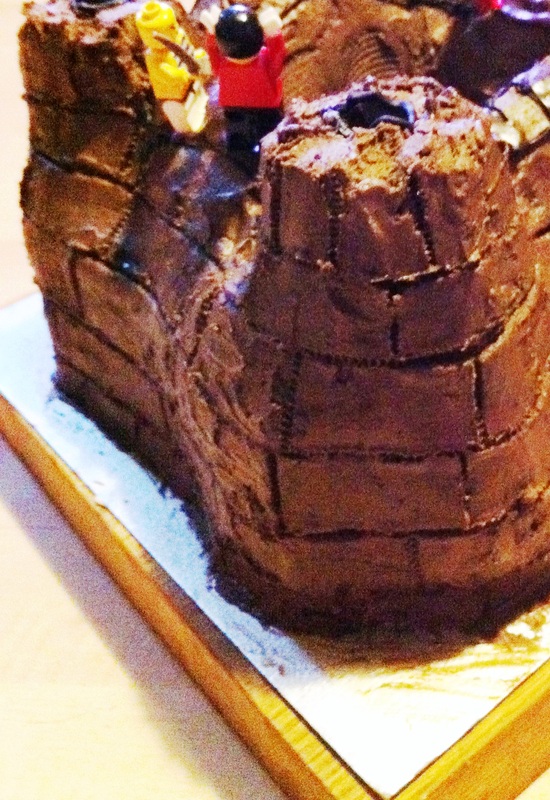 The cake itself was a simple loaf-tin sponge. Because there was to be so much decoration, I didn’t want to worry about the layers sliding everywhere. This came straight out of the oven, and was sliced 2/3 to 1/3, to make the engine and coal tender. The engine cab was made out of a small 4 inch diameter sponge, cut in two and sandwiched together. I covered this separately with fondant to make the train itself super-simple, just one big square to ice, instead of lots of fiddly bits! Then came the decoration. Again this was an easy choice, another of my dads favourite things, liquorice. 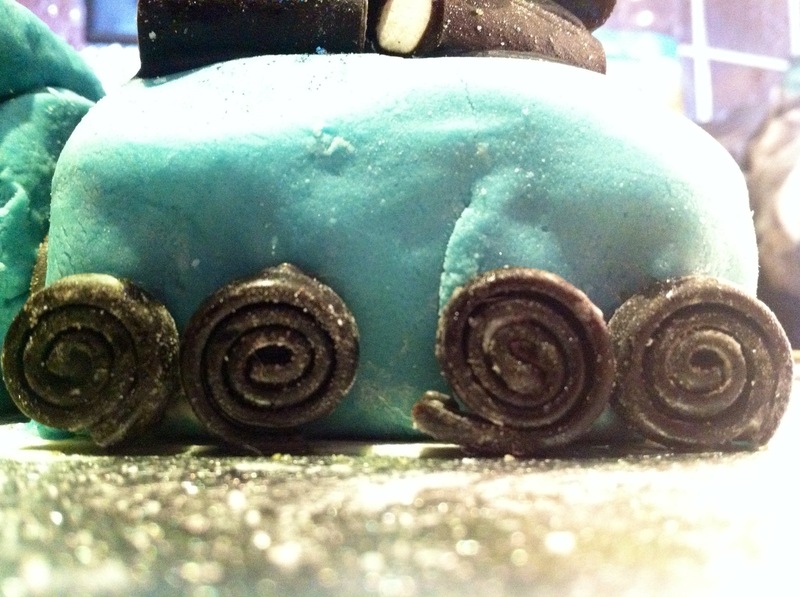 I bought some liquorice catherine wheels, but they were far too big for the size of the cake! They were very easy to unravel, and I re-rolled them into smaller circles, secured with a bit of water (to make the ends stick together) and some black icing. The coal tender I had fun with! Firstly i painted a black square on the top, with some thick black icing (basically just food colouring + icing sugar, maybe a couple of drops of water). 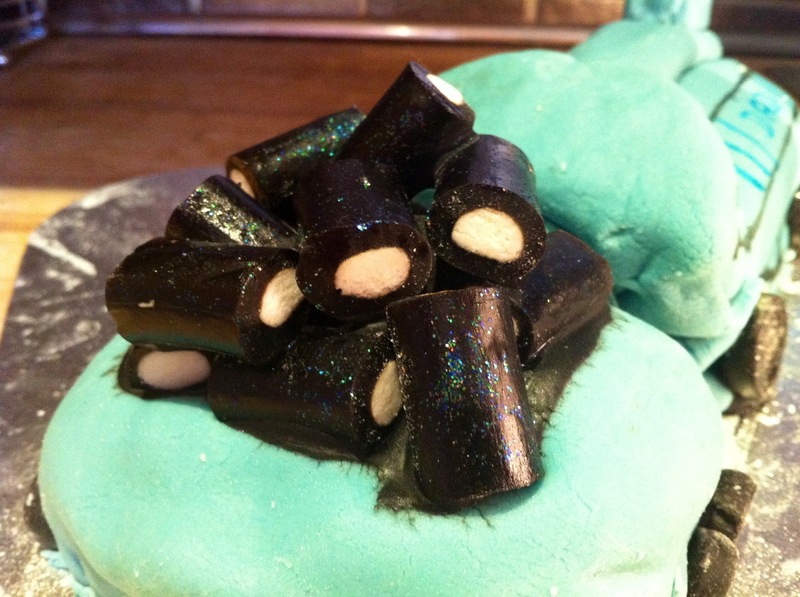 Then I picked out all the black tubes from my pack of liquorice allsorts, and placed them randomly, stacking them up on top of the tender, gluing in place with some more black icing. A sprinkle of black glitter and my “coals” were good to go! 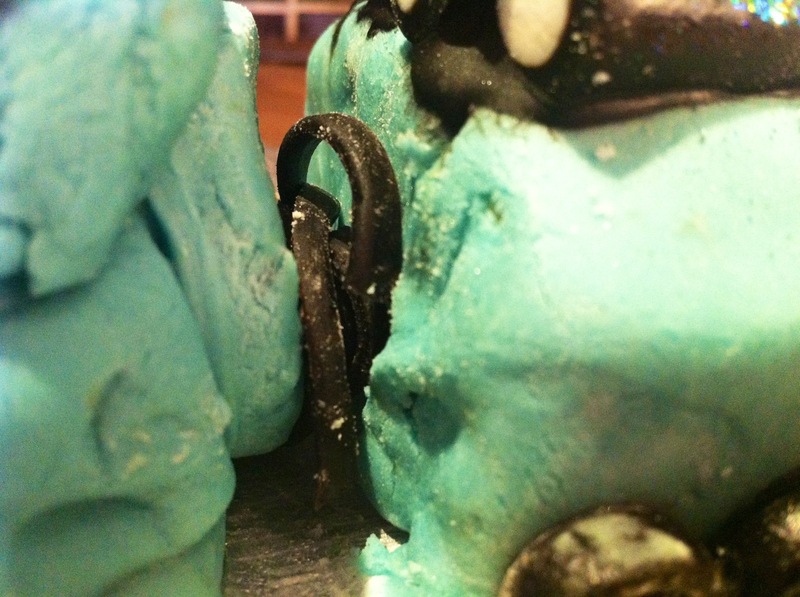 A couple of square liquorice allsorts, one wrapped in fondant, formed my funnel, and some spare catherine wheel strings went in between the 2 pieces of cake, to look like the coupling between the engine and tender. For some finishing touches, I took up my paint brush and some food colouring. This included the wheel details, cab windows, and main engine detail. 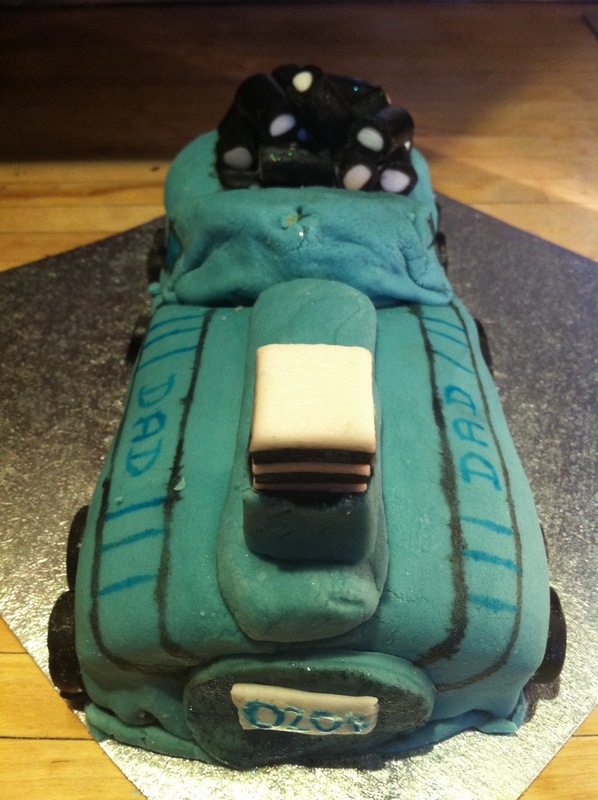 Given that it was his birthday I wanted to make it personal – with “dad” on the side, and his date of birth (which you can just see) on the very front number plate. He was really pleased with the cake – as was I!